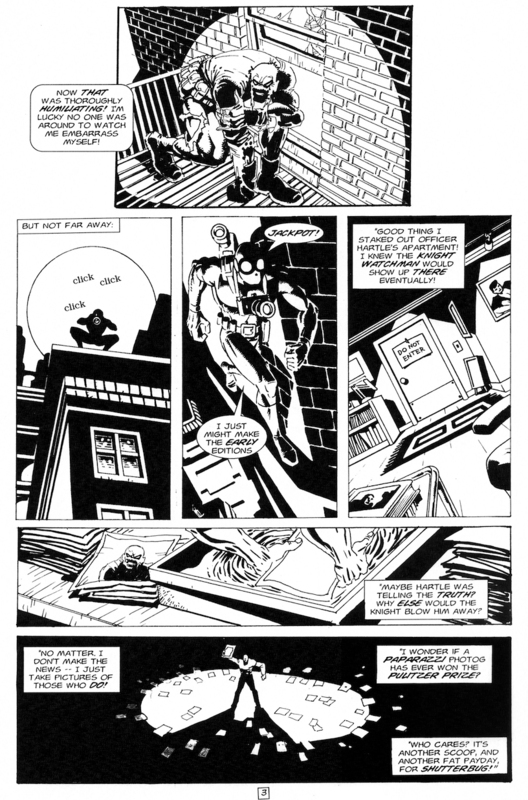 The story itself picks up where #2 ended, with the Knight Watchman in a free-fall after being blasted off the ledge of a tall apartment building. He had gone there to confront the police officer he’d entrusted with a captured bad guy who later turned up dead and blamed the murder on the Knight. A fall guy indeed. However, the window to the apartment was boobytrappped and set off a bomb which sent the KW sailing and killed the policemen inside the building. The Watchman managed to grab onto a fire escape to break his fall (and almost his shoulder). Unfortunately, the masked paparazzi photographer known as Shutterbug had been on hand to take pictures of what appeared to be the KW setting off the bomb deliberately. There was also a squad of cops down below, waiting for the Knight Watchman. It was all a set-up, of course. Acting Mayor John Princeton was working with the arch criminal the Pink Flamingo, each with their own agenda. Princeton wanted to discredit the Watchman and establish his own Badge unit of armored cops. 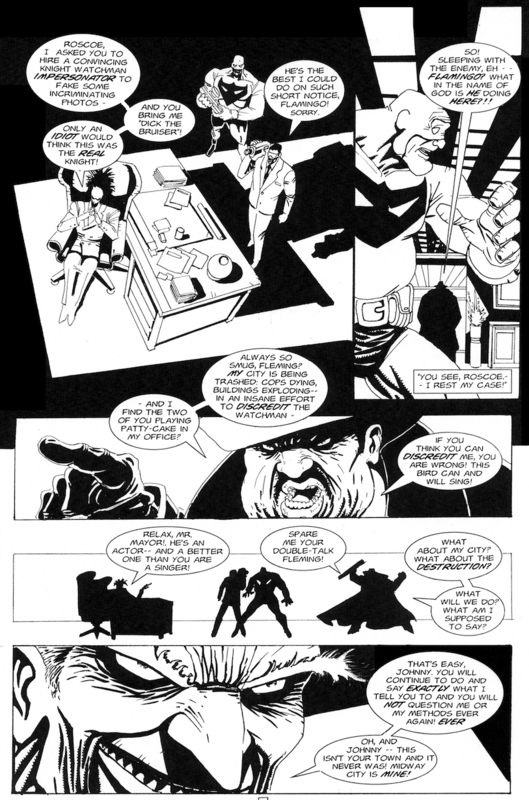 The Flamingo merely wants to eliminate his foe the Watchman, and become the main crime boss in Midway City. 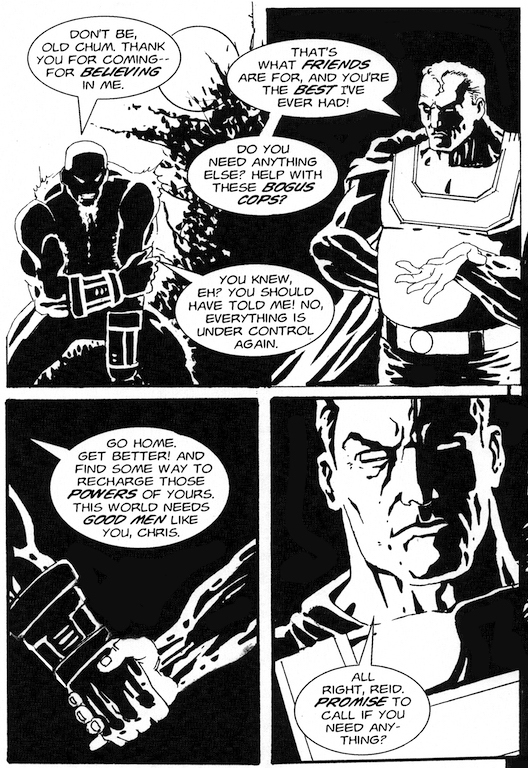 The next day, the Knight Watchman (in disguise) visits his ex-partner and successor Galahad at the hospital to make sure that his former sidekick knows that he is innocent. Galahad’s leg had been shattered in the assassination attempt that almost killed the real Mayor, Lionel Richards. 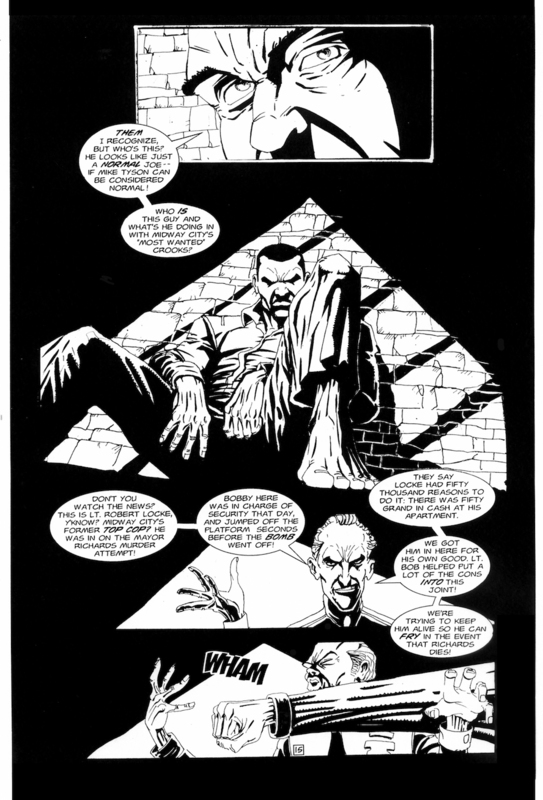 After that, KW heads out to Wertham Prison to meet with Officer Bob Locke, who had been framed and locked up for the attack on Mayor Richards. 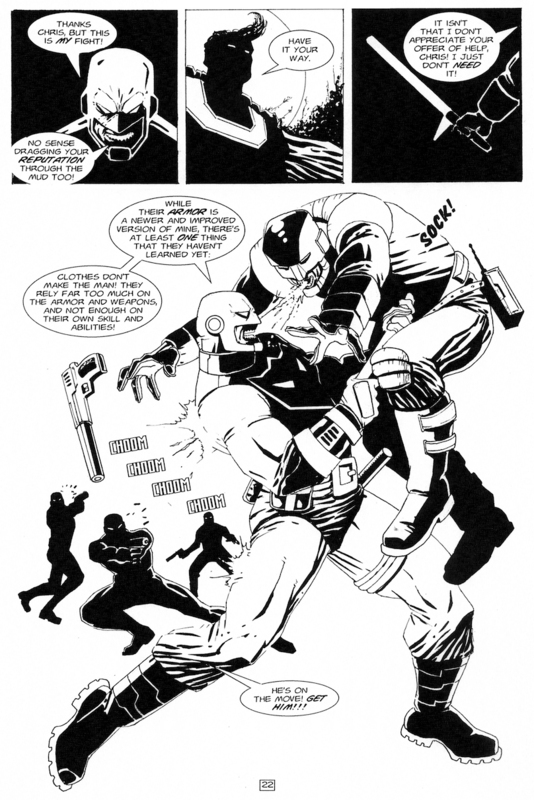 Locke was previously seen as Brother Hood in the back-up story in Berzerker #4 in 1993 from Caliber Press. 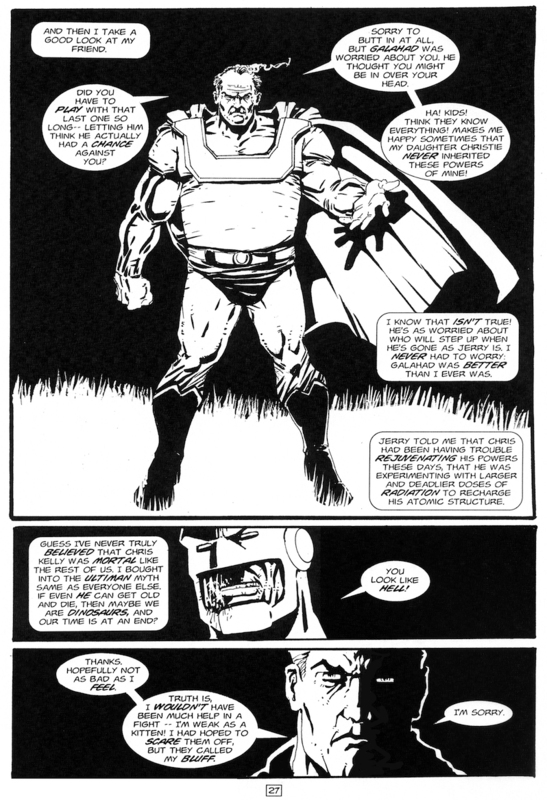 The back-ups in those first 4 issues of Berzerker introduced the major Big Bang characters and convinced Caliber to give Big Bang its own title. 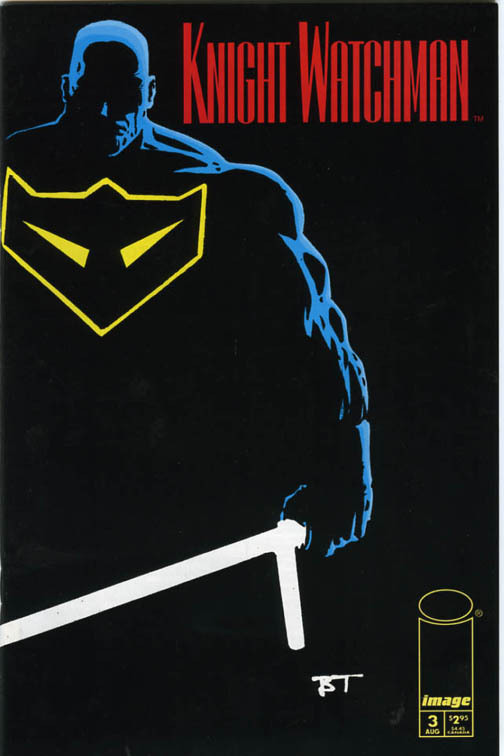 (Spoiler alert – that Brother Hood story is actually a sequel to, and takes place after Graveyard Shift #4). Locke, the city’s former top cop, tells KW that he had been investigating corruption including payoffs and kickbacks that led back to John Princeton, but the evidence disappeared and was replaced with dirty money and other “evidence” tying him to the assassination attempt. 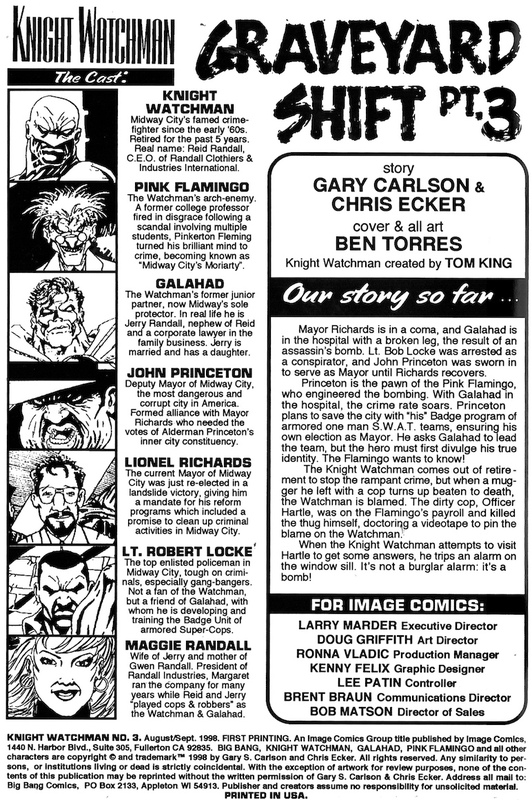 While at Wertham, we get a look at some of the Watchman’s rogues gallery, including a few that never did get their stories told in Big Bang Comics. We see Grandfather Clock and Mr. Mask (now going by Deathmasque) as well as Paper Doll, the Creep and the Cheshire Cat. 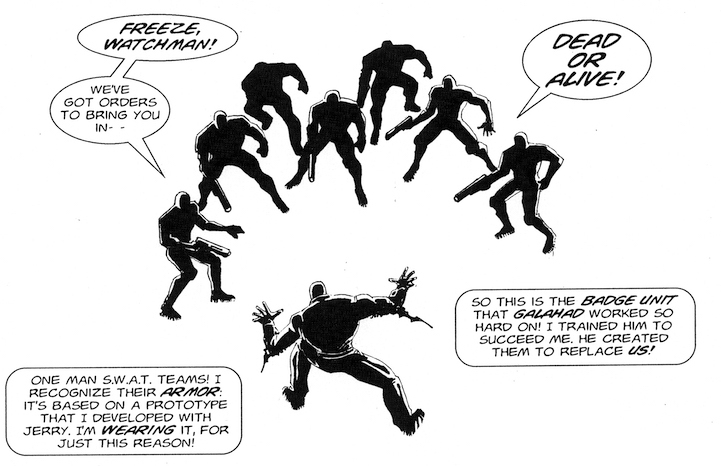 The Knight Watchman leaves the prison, only to be confronted by seven members of the super-cop Badge unit to take him in. 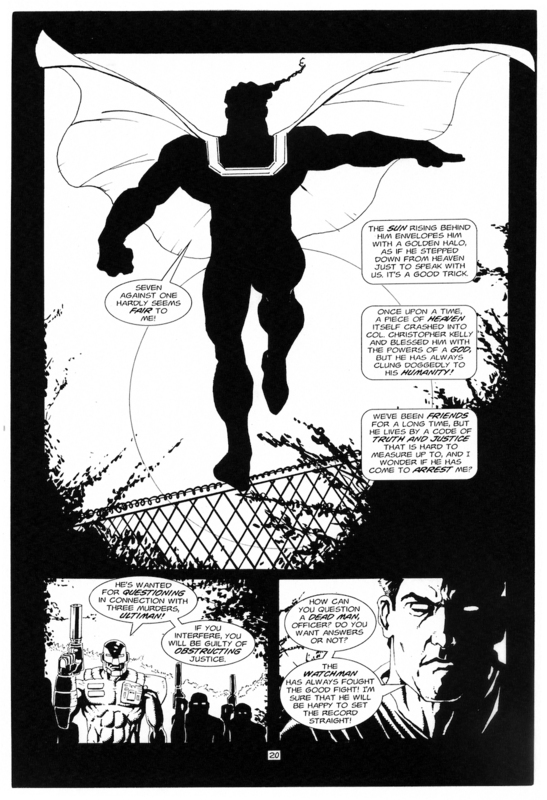 KW’s old pal Ultiman appears in the sky to help, but KW tells him to stay out of it. The Ultimate Human Being can only watch as the Watchman beats up the Badges, who turn out not to be cops but some of Pink Flamingo’s flunkies sent out to kill KW. After the fight, Ultiman lands and he’s in worse shape than the Watchman. He had been having trouble rejuvenating his powers with the radioactive meteor that had given him his powers. Nearly powerless, he had still shown up to help out his friend. 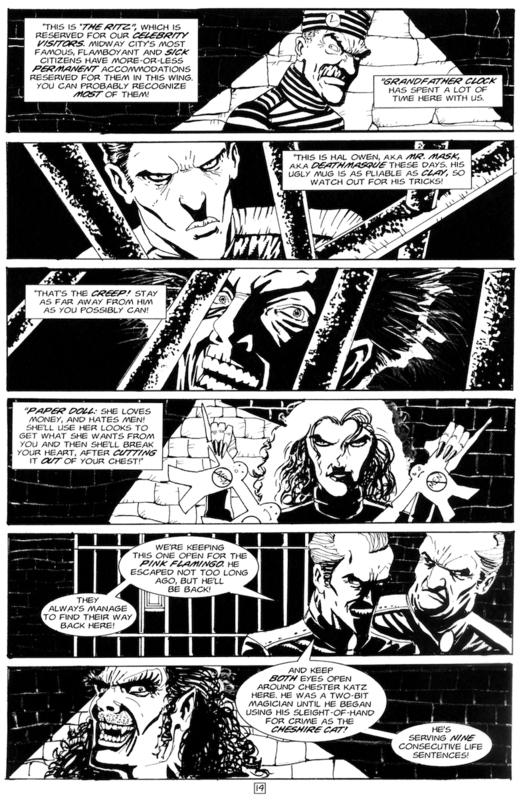 (Note: the dialogue sets up the timing to establish that this story takes place prior to the story in Megaton #1 in which Ultiman’s recharging goes very wrong and establishes his daughter Christie as Ultragirl, and Ultiman’s supposed death). Ultiman flies away and the Knight Watchman heads back to town for a confrontation with the Pink Flamingo, that will occur in the next issue. There are a few pin-ups by artist Ben Torres to fill out the issue and a peek at Ben’s cover to Graveyard Shift #4.